郭凤霞, 戚俊, 2018. 2009年11月13日至12月19日北京气溶胶吸收特性分析[J]. 气象, 44(7): 921-928. DOI: 10.7519/j.issn.1000-0526.2018.07.007. GUO Fengxia, QI Jun, 2018. 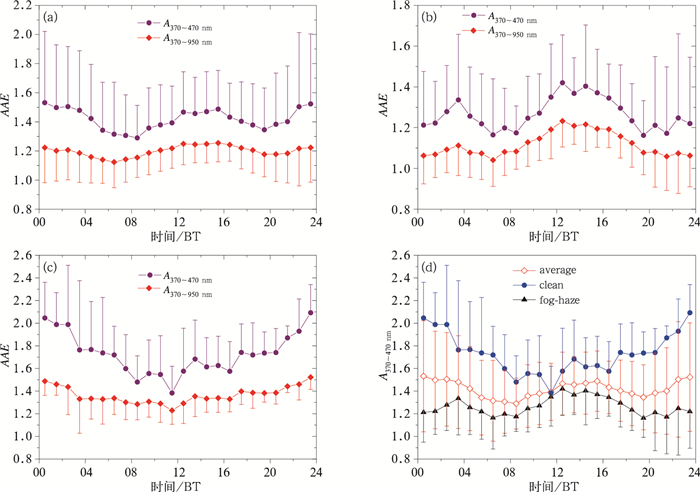 Analysis of Aerosol Absorption Properties in Beijing from 13 November to 19 December 2009[J]. Meteorological Monthly, 44(7): 921-928. DOI: 10.7519/j.issn.1000-0526.2018.07.007. Abstract: The effects of traffic emission and heating in winter on the components of atmospheric aerosol were revealed by using the relation between the properties of aerosol and the aerosol absorption Å ngstrom exponent (AAE) as the indicator for the aerosol's composition, based on a 37 d measurement campaign from 13 November to 19 December 2009 with the Aethalometer in the region of Beijing. The diurnal variation characteristics and the comparison analysis were studied on the 37 d average, clean, and fog-haze conditions. The results showed that the AAE reached the minimum during traffic rush-hours and increased at other times in the average and fog-haze conditions. In clean condition, the AAE decreased gradually from nighttime to daytime, and an inflexion would turn with the advent of the traffic rush-hours. The AAE was significantly higher in clean condition than in the two other conditions, and the difference became more significant at night. Combining the varied weather conditions, the paper demonstrated that significant emi-ssions of brown carbon-containing aerosols in the region of Beijing in winter, especially during the night, and emissions of the fine particles during traffic rush-hours, as well as the important impact on the components of aerosol in ambient atmosphere. 黄印博, 黄红莲, 韩永, 等, 2007. 合肥、东南沿海地区气溶胶光学特性测量及模式分析[J]. 大气与环境光学学报, 2(6): 423-433. 娄淑娟, 毛节泰, 王美华, 2005. 北京地区不同尺度气溶胶中黑碳含量的观测研究[J]. 环境科学学报, 25(1): 17-22. 王庚辰, 孔琴心, 刘广仁, 等, 1998. 秋末冬初北京大气中颗粒物的变化[C]//第七届全国大气环境学术会议论文集/大气环境科学技术进展. 北京: 中国环境科学学会大气环境分会: 210-215. 张美根, 徐永福, 张仁健, 等, 2005. 东亚地区春季黑碳气溶胶源排放及其浓度分布[J]. 地球物理学报, 48(1): 46-51. 张仁健, 王明星, 胡非, 等, 2002. 采暖期前和采暖期北京大气颗粒物的化学成分研究[J]. 中国科学院研究生院学报, 19(1): 75-81. 张小曳, 孙俊英, 王亚强, 等, 2013. 我国雾-霾成因及其治理的思考[J]. 科学通报, 58(13): 1178-1187. Favez O, Cachier H, Sciare J, et al, 2009. Evidence for a significant contribution of wood burning aerosols to PM2.5 during the winter season in Paris, France[J]. Atmos Environ, 43(22/23): 3640-3644. Jacobson M Z, 2004. Climate response of fossil fuel and biofuel soot, accounting for soot's feedback to snow and sea ice albedo and emissivity[J]. J Geophys Res:Atmos, 109(D21): D21201. Puxbaum H, Caseiro A, Sánchez-Ochoa A, et al, 2007. Levoglucosan levels at background sites in Europe for assessing the impact of biomass combustion on the European aerosol background[J]. J Geophys Res:Atmos, 112(D23): D23S05.